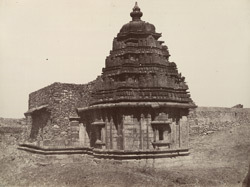 Photograph of the Lakshminarayana Temple at Lakkundi in Karnataka, taken by William Henry Pigou, c. 1857, from 'Architecture in Dharwar and Mysore'. The little town of Lakkundi (ancient Lokigundi) has about 50 temples, testament to its status in the past as an important city of the medieval rulers of the Deccan, particularly the Later Chalukyas of Kalyana from the 10th to the 12th century. The Chalukyas were prolific temple builders and major sites include Lakkundi, Ittagi, Gadag, Dambal, Hangal, all within the radius of north Karnataka. The monuments at Lakkundi are both Hindu and Jaina. The Hoysalas who took over territory of the Chalukyas in the late 12th century even established their capital at Lakkundi in 1191, before moving to Dwarasamudra (Halebid) in the mid-13th century. The Lakshminarayana Temple, dedicated to Vishnu, is built in a different style from all the other temples at Lakkundi and has similarities with Hoysala temples. It has a sanctuary with a slender pyramidal roof and in front the remains of a hall. The carvings on the roof include monster faces, foliation and icons of the gods. The temple was probably built between AD 1150 and 1250.